Michael Schumacher powered to victory at the Chinese Grand Prix, with the win moving him level on points with title rival Fernando Alonso. It was another masterful display by Schumacher who looked out of contention early in the race when Alonso's Renault led, but pulled a proverbial rabbit out of a hat to win. As Alonso led, Schumacher was sixth and anonymous until lap eight when the German gained a place and began to show how good the Ferrari was on its intermediate Bridgestone tyres. When Kimi Raikkonen's second-placed McLaren expired with a throttle problem on lap 19, Schumacher was up to second and pitted on lap 21. Alonso pitted on lap 22 and changed tyres. His title rival stayed on the original set and this proved crucial. Alonso found himself four seconds a lap slower than the rest of the leading group as the tyres refused to come up to optimum temperature quickly enough. Schumacher, therefore, was the danger to Alonso but the Spaniard had another problem: his team-mate Giancarlo Fisichella was being caught and attacked by Schumacher so made a move for the race lead and passed Alonso. 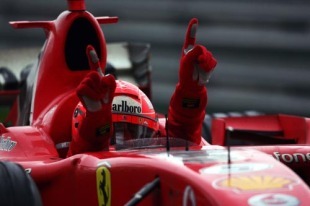 The Spaniard then had to defend from Schumacher and was powerless to stop the Ferrari. Alonso fell away in third and Schumacher set about Fisichella. The Roman led after the final pit stops but then slid wide at turn one on his out lap. Schumacher needed no second invitation and raced through, much to Renault boss Flavio Briatore's annoyance. Alonso's tyres were now working again and he caught and passed Fisichella, whose motivation appeared to drain away. He plodded round to a hapless third while Alonso secured second, well adrift of Schumacher. Post-race, though, the pressure told as Fisichella hit out at anyone and everyone, especially the Renault team. "I feel a little alone," he complained. "I was uncompetitive at Indy and again in China. I felt I should have had more support from the team." Not surprisingly, he would retract his remarks a race later.